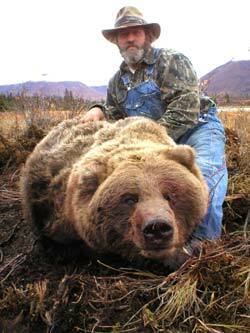 We offer decades of experience guiding Alaska Bear hunting adventures all across the state. People often say they have a dream of hunting Alaska brown bears, interior grizzly bears, or black bears. Top Gun Treks offers a variety of hunts to target all of these. 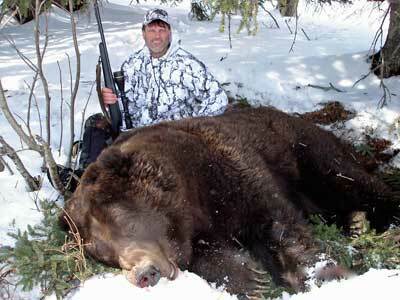 We offer both spring and fall fully guided brown bear hunting trips for coastal an inland brown and grizzly bears. We also offer spring and fall black bear hunts in a variety of locations inside our vast hunting areas. 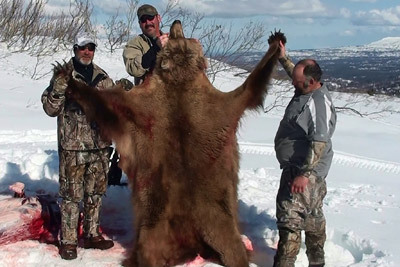 Our Alaska bear hunting trips happen in the spring and fall. There are many different ways and methods we can utilize to hunt bears. Spot and stalk hunts are the most standard way to bear hunt. We spend lots of time glassing and we often see several bear a day. In the spring we can brown bears by flying and spotting bear dens as the bears emerge after their winter nap. We fly until we spot a den, then land and set up a spike camp. The next morning we snow shoe in and set up on the den until we can get a shot on the bear. In the fall we often hunt bears that are busy feeding and fattening up for the winter. This means finding bears on rivers feeding on fish or hillsides feeding on berries. In the fall bears often feed nonstop to put on the fay they will need for the winter hibernation. NOTE: *** In the spring of 2006, the Alaska Department of Fish and Game increased the personal harvest limit from 1 brown bear per year to 2 brown bears per year for the units we hunt. This was done to due to the unusually large population of brown bears in this area. This rule gives our clients the very rare possibility of taking 2 brown bears on a single Alaska brown bear hunt. Alaska brown bears and grizzly bears are the same species genetically, but they live in different geographic areas, have different diets, and different hibernation routines. Brown bears live in coastal areas, have access to higher protein sources such as fish, and den less days per year which mean they eat more. Since Alaska brown bears have the genetics to continue to grow their entire life, steady food sources and more days awake account for their enormous size. Alaska Grizzly bears live in interior areas of the state, have less access to steady protein, and sleep more days per year than their coastal counterparts. This means they don’t get as large and they range farther for food. Alaska black bears are plentiful in most parts of the state and are fairly easy to hunt. They can be hunted spot and stalk or over bait and we have good areas for both.